With its rich history, stately mansions, moss-draped oaks, nostalgic country squares and scenic parks, Savannah is a top vacation destination for people of all ages. Whether you’re looking for a romantic getaway, a fun-family adventure or just a quick weekend escape, Savannah’s got something for everyone. Here’s a quick guide to help you plan your trip. In Savannah, you can explore historic houses, view artistic masterpieces, enjoy a sunny picnic, take a river cruise, dine in iconic restaurants, tour through haunted hot spots and so much more. This lovely mansion in the historic district was deemed a National Historic Landmark in 1965, making it the city’s first on the National Register of Historic Places. The birthplace of Girl Scout Founder Juliette Gordon Low, the home is owned by the Girl Scouts of America and is a museum open to the public. The house features many of the Low family’s original furnishings, artwork by Juliette and an array of Girl Scouts’ artifacts. They offer tours daily and activities and special events just for Girl Scouts. A visit to Savannah most definitely needs to include a stop at Forsyth Park, a 30-acre park in the heart of downtown. This beautiful green space includes bike and jogging trails, basketball and tennis courts, a café, children’s play area and the iconic Forsyth Fountain—the centerpiece of this popular landmark. The Telfair Art Museums include three different facilities, Telfair Academy, Owens-Thomas House and Jepson Center. Each museum features collections of magnificent artwork: Telfair Academy has two 19th century period rooms that feature American and European art including paintings, sculpture, works on paper and decorative arts; Owens-Thomas House, a National Historic Landmark, offers a large collection of decorative arts, including Owens’ family furnishings, as well as an English inspired parterre garden and an intact urban slave quarters; and the modern Jepson Center is dedicated to contemporary art and rotating exhibitions featuring 7,500 square feet of gallery space. If architecture is your interest, a visit to this 50-block area near historic Savannah is something you won’t want to miss. A stroll through this residential area will treat you to a view of some of the most beautiful Victorian homes, including charming gingerbread abodes, post Civil-War era homes and grand mansions. Stained glass windows and other unique architectural features make for great photos as a keepsake of your Savannah vacation. Picturesque views, river cruises, shopping, dining and entertainment abound in and around River Street. There’s much to do and enjoy in this Savannah area, including Factors Row and Factors Walk, historic brick buildings that were once the epicenter for the city’s cotton exchange, where the factors and brokers worked and set the prices of cotton worldwide. Today, these warehouses are home to antique galleries, restaurants, chic shops, pubs and more. Eat, Drink and Be Entertained! With every imaginable cuisine, including good old fashioned southern cooking, dining in Savannah is a treat! On your list of restaurants you won’t want to miss, be sure to include The Lady and Sons, owned by famous culinary star and author Paula Deen, the Olde Pink House, The Pirates House and Mrs. Wilkes Dining Room, among others. And while you’ll find something to suit everyone’s palate, don’t miss the opportunity to dig into some famous Savannah fried chicken, grits, fried green tomatoes and other local favorites. While you’re in Savannah, you may want to make a stop at Savannah College of Art and Design’s shop, a gallery located on Bull Street that features a unique and ever-changing collection of items created by SCAD students, alumni and staff. Jewelry, handbags, accessories and one-of-a-kind treasures lure in visitors and the fact that you can purchase a treasure by an up and coming artist. Located in City Market, this one-of-a-kind museum brings the roaring 20s to life with fascinating exhibits and an authentic speakeasy. Here, you’ll have the opportunity to learn about the Prohibition era and view the largest collection of moonshine stills, a fully-restored Model-T and more. 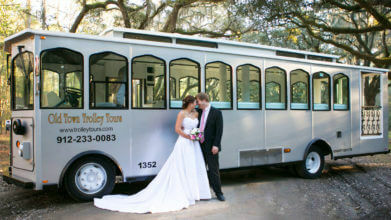 To see the best of the city, Old Town Trolley Tours offers the most comprehensive sightseeing tour. Our hop on, hop off, fully-narrated tour transports you to more than 100 sights and points of interest, including those on River Street, in the historic district, the country squares and downtown. And because we have trolleys coming and going all day long, you can stay as long as you wish at each of the stops, enabling you to enjoy the sights at your own pace. Voted America’s Most Haunted City, Savannah is home to many sites that are teeming with supernatural activity. To learn about the city’s most infamous hauntings and spirits, spend an evening aboard the Trolley of the Doomed on the Ghosts & Gravestones Tour. This guided tour is led by a costumed narrator who will share many spooky facts and intriguing stories about the city’s paranormal history. You’ll also have exclusive nighttime entry into two of Savannah’s most haunted sites.